End stage alcoholism is the final stage of alcoholism, when serious mental health and medical issues are beginning to appear, potentially leading to death. Is There a Cure to Alcoholism? End stage alcoholism is the final stage of alcoholism. This stage is the most destructive. Typically, an individual reaches end stage alcoholism after years of alcohol abuse. At this point, people who have spent years drinking may have developed numerous health and mental conditions in addition to their alcohol abuse. The individual may have isolated themselves, lost their job, or damaged major organs in the body. Another consequence is the risk to their overall health as the organs shut down. The first stage is social drinking. This is a comparatively non-threatening level of drinking, which may not always lead to alcohol abuse. This is generally consuming a few drinks when out with friends. The second stage is binge drinking. Binge drinking is a common practice affecting 1 in 6 American adults, resulting in the consumption of 17 billion drinks each year. Binge drinking can be temporary, or occur often, signaling the threat of future heavy drinking or alcohol abuse. The third stage is heavy drinking. At this stage, the person has taken too much of a liking to alcohol. They may drink more frequently, each day, or drink excessive amounts when drinking socially. Having more than 5 drinks in 2 hours is commonplace (and problematic). The fourth stage is alcohol dependency. At this point, the drinker depends on alcohol to feel “normal” and may experience negative symptoms or feelings when they are not drinking. This dependency may have underlying emotional and mental motivations. The fifth stage is addiction to alcohol or alcoholism. When a person has become an alcoholic, they begin to exhibit a variety of behaviors that have a negative impact on their health and personal and professional lives. For example, alcoholics will continue to drink despite it causing them negative consequences. Lastly, the final stage, known as the end-stage of alcohol abuse is the point where the alcoholic is experiencing very serious health and mental issues, and could possibly be in danger of death. End stage alcoholism typically presents a number of health complications. First, the liver becomes damaged, and possibly permanently. The liver gain fats and inflammation, eventually leading to liver scarring. The result of the liver damage is often liver disease or cirrhosis. The damaged liver can cause other complications in the body since it is a vital organ. The liver is responsible for over 500 tasks to ensure the body is functioning as healthy as possible. Other health complications like heart problems and stroke stem from chronic alcohol abuse in end stages alcoholism. Risks of dementia and cancer increase. Even brain damage and hepatitis can occur in end stage alcoholics. 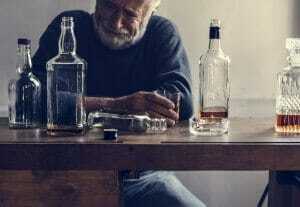 Wernicke-Korsakoff Syndrome (WKS), also called alcohol dementia, occurs most frequently in end stage alcoholism. With this syndrome, there is a shortage of vitamin B-1, which manifests as dementia-like traits. Also called Wernicke Encephalopathy, this condition produces leg tremors, staggering, vision changes, and problems maintaining balance. Lastly, people are often confused and have problems staying sharp or learning new things. Drooping lids, hallucinations, and double vision are also symptoms associated with this condition. In the end-stages of alcoholism, there are noticeable health conditions like jaundice from liver failure that can get the attention of the individual suffering. There are also more subtle signs like itchy skin, fluid retention, fatigue, and bleeding that signal another problem. If you know someone who drinks regularly and has these symptoms, consider calling a treatment specialist to get them they care they need. Am I in Danger of Alcoholism? Alcoholism varies greatly from binge drinking and heavy drinking, with more serious effects. Sadly, many people use alcohol to heal trauma, give them courage in areas where they are insecure, or combine them with other drugs. These unhealthy ways of coping and reckless drug use will only complicate and worsen an alcohol use disorder. If someone has increased their drinking significantly, there could be a problem. Heavy drinking is a threatening practice which can easily transition into alcoholism or an alcohol use disorder. If you or a loved one denies they have a problem with alcohol abuse, or cannot stop or cut back on their drinking, they are be in danger of alcoholism. If you or a family member or friend suffers from end stage alcoholism, there is hope for recovery. Future patients can gain knowledge on different facilities and discover what treatment options are available.Please contact a treatment expert today, and start the journey to sobriety.